^ LENINE'S MIGRATION A QUEER SCENE, Arthur Ransome for The New York Times, 16 March 1918. ^ "Law of the USSR of March 14, 1990 N 1360-I 'On the establishment of the office of the President of the USSR and the making of changes and additions to the Constitution (Basic Law) of the USSR'". Garant.ru. Retrieved 12 July 2010. ^ a b c Конституции РСФСР 1918 г. (in Russian). Hist.msu.ru. Retrieved on 22 June 2011. 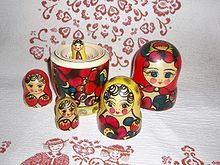 ^ a b c Soviet Russia information. Russians.net (23 August 1943). Retrieved on 22 June 2011. ^ Colloquially referred for short in intra-Soviet politics (along with the adjacent "Transcaucasian Federation" in the south until 1936). See for example, the log of the meeting of the Supreme Soviet of the USSR on February 19, 1954. The Russian SFSR officially renamed into the Russian Federation on Christmas Day, 25 December 1991. ^ Declaration of Rights of the laboring and exploited people (original VTsIK variant, III Congress revision), article I. 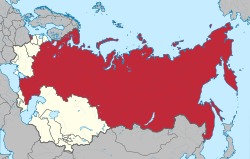 ^ a b c d The Free Dictionary Russian Soviet Federated Socialist Republic. Encyclopedia2.thefreedictionary.com. Retrieved on 22 June 2011. ^ Peterson, James A.; Clarke, James W. "Petroleum Geology and Resources of the Volga-Ural Province, U.S.S.R." (PDF). Pubs.USGS.gov. 1983, U.S. Department of the Interior - U.S. Geological Survey. Retrieved 11 March 2015. ^ Sokolov, Vasily Andreevich (2002). Petroleum. Honolulu: University Press of the Pacific. p. 183. ISBN 0898757258. Retrieved 11 March 2015. ^ Mawdsley, Evan (2007). "Sovdepia: The Soviet Zone, October 1917 – November 1918". The Russian Civil War. Pegasus Books. p. 70. ISBN 9781933648156. Retrieved 25 January 2014. The Bolsheviks' enemies gave the name 'Sovdepia' to the area under the authority of the Soviets of Workers' and Peasants' Deputies. The comic-opera term was intended to mock [...]. ^ "Russia the Great: Mineral resources". Russian Information Network. Retrieved 22 November 2010.